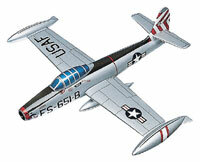 F-84 Thunderjet Jet Fighter Military Model Aircraft. Plastic Model Kits, Diecast Models, Wooden Aircraft. F84 Thunder jet Military jet fighter models. Military jet fighters from the US Air Force. Scale model kits, plastic model kits, diecast models and wooden aircraft models. All of these model kits are a tremendous military history and aviation history training tools for both adults and kids. These are toys and display models. F-84 Thunderjet Military Aircraft Section.of the Jet Fighter Model Department.in the YellowAirplane store. Military Jet Fighter, mahogany, plastic model kits, diecast models. Thunderjet, Thunderstreak & Thunderflash The Republic F-84 Thunderjet was the first post-war U.S. jet fighter, coming after the late WWII P-80 Shooting Star and not achieving the charisma of the later F-86 Sabre. A fighter-bomber by trade in Korea, it was also an interceptor and photo recon aircraft. It was the first jet fighter that was able to air-refuel and the first jet fighter able to deliver a nuclear weapon. The Thunderbirds flew the Thunderjets in 1953 and 1954. These F-84 Thunderjet models come in wooden aircraft models for display, plastic model aircraft kits and metal diecast aircraft models. F-84 Thunderjet Model Jet Fighters. Introduced in 1947, the Republic F-84 Thunderjet was the U.S. Air Force's primary strike fighter during the Korean War, accounting for 60% of all enemy ground targets destroyed. A replica of an F-84 "G" variant - capable of delivering a Mark 7 nuclear bomb - of the Thunderjet from 1951, this 1/32 scale, plastic kit features engraved panel and hatch lines; a well-equipped cockpit with a choice of two ejection seats, a photo-etched safety belt, and a glazed canopy; optional-position flaps and perforated speed brakes; prototypical wingtip fuel tanks; an assortment of missiles and bombs; realistic landing gear with metal struts and real rubber tires; a choice of markings (the 58th FBG "Four Queens" or the French Armee de l'Aire); and more. 14¼" long with a 13½" wingspan; 290 parts, assembly required. With the outbreak of war in June, 1950, the 49th Fighter-Bomber Wing was one of the first U.S. Air Force units dispatched to Korea. "Four Queens," the famous straight-wing F-84G Thunderjet flown by Col. Joe Davis, Jr., (the commander of all F-84 units in Korea who later came up with the concept of laser-guided bombs) when he led a formation of 24 F-84s in an attack against Chunggangjin airfield on July 27, 1953. 430th Fighter-Bomber Squadron, 474th Fighter-Bomber Wing, markings, including Davis' personal "Four Queens" artwork (representing his wife and three daughters) below the canopy. a straight-wing F-84G Thunderjet - the first production fighter-bomber with in-flight refueling capability and the first with the ability to deliver a nuclear weapon - flown by the Hellenic Air Force's 337 Mira "Fantasma" (Ghost) Squadron when it was stationed at Larisa Air Base in 1952. After six months of training in an unofficial capacity, the U.S. Air Force's 3600th Air Demonstration Team "Stardusters" were activated on May 25, 1953, at Luke Air Force Base. Upon the order of Gen. Bob Harper, the "Stardusters" changed their name to "Thunderbirds" just 30 days after their first official show. a straight-wing F-84G Thunderjet flown by the "Stardusters" at the beginning of that inaugural season. straight-wing F-84G Thunderjet - the first production fighter-bomber with in-flight refueling capability and the first with the ability to deliver a nuclear weapon - flown by the French Air Force's EC 3/1 "Argonne" when it was stationed at Saint-Dizier in the mid-1950s. F-84 Military History Study Notes. Designed by Republic, the Thunderjet was their first production jet aircraft and a direct descendent of the successful P-47 Thunderbolt. Thunderjets became workhorse bombers during the Korean War and were capable of delivering bombs and rockets in the ground attack role. A huge success in Korea, the F-84 was the U.S.'s first post-war jet fighter to make a significant contribution in combat. USAF Thunderbirds performing in early jet F-84s. The Thunderjet was among America's first generation of jet fighters, and it flew over 86,000 sorties in Korea. Thunderjet, Thunderstreak & Thunderflash: A Photo Chronicle McLaren. The Republic F-84 was the first post-war U.S. jet fighter, coming after the late WWII P-80 and not achieving the charisma of the later F-86 Sabre. A fighter-bomber by trade in Korea, it was also an interceptor and photo recon aircraft. It was the first able to air-refuel and the first able to deliver a nuclear weapon.